As you all know, I love Mexican Food. Mexican Food is by far my favorite cuisine and I have no problem eating it multiple times per week. Heck, I’ll even eat it multiple times per day. 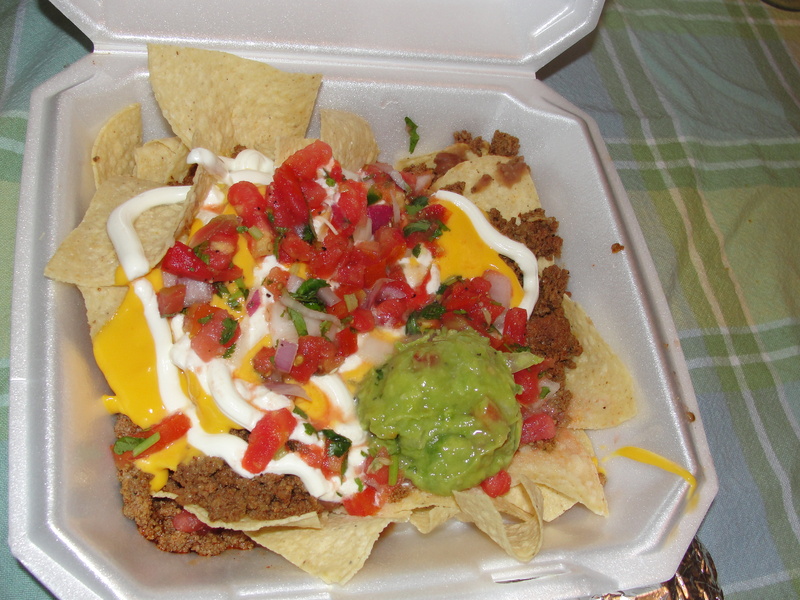 Loaded Nachos are one of those items that are Mexican, in the sense of Tex-Mex but not true Mexican. That’s okay with me as I love Tex-Mex just as much as Mexican. But, I rarely ever eat Loaded Nachos. Yes, I make some homemade ones that are simply to die for but, I really only make them a handful of times per year. The last time I ordered Loaded Nachos out, prior to the experience we will be discussing, was probably years ago. I guess for me, chips go with the meal. There are many other Mexican items I’d rather gorge myself on. On Cinco de Mayo, when we had Taco Ardiente, we decided to order some Loaded Nachos. And to that, my friends, I Say Ole. These nachos were served in a take out box and consisted of chips, ground beef, beans, pico, cheese, sour cream and guacamole. On first look, these really did not look impressive. The chips were certainly not homemade however, once I began to eat them, I did not mind. No, they were no way as good as Lozano’s chips but, they were crispy, crunchy and fresh. Plus, they held up well to all of the toppings on the nachos. The ground beef was slightly seasoned yet did not have that overpowering salt taste – a good thing indeed. The beans were slim yet the few I did have, tasted fine…nothing much can be said of them. The cheese that was used, was of the nacho cheese whiz variety. Typically, I’m not a big fan but, Taco Ardiente made it work on these nachos. The pico was quite fresh & chunky. Both the sour cream and guacamole were also good. So, what did everything taste like together? Pretty darn good as it turns out. A few of the bites I had, only had a few of the items. But man, on the bites that I had that contained a little bit of everything, these were awesome. The crunchy chips held together the soft, warm ground beef. The nacho cheese was slightly warm and had a gooey consistency. Add all of that to the chunky & cold pico, plus a touch of sour cream and guacamole – and there you have it…some good, delicious Loaded Nachos. When everything was together, it was pure harmony. Not that the bites with only some of the items weren’t good…its just the bites with everything were that much better. Although my typical Mexican/Tex-Mex order won’t be changing to Loaded Nachos any time soon, the offerings from Taco Ardiente are pretty awesome. The combination of warm, gooey, chunky and cool are just divine. We had no problem eating all of these Nachos, in addition to all of the other food we ordered. For normal people, the Loaded Nachos alone would be plenty. But for my family, half-Mexican and on Cinco de Mayo, these were simply a side item. Mexican Food Rocks. To that, I Say Ole.